The following is a guest post by Stephen Carter. 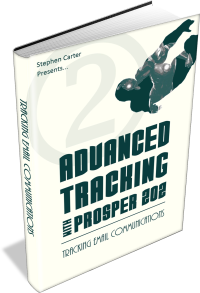 Stephen is a software developer turned internet marketer, and the author of the 4-volume series Advanced Tracking With Prosper202 which can be found at http://Prosper202Guide.com/ This guest post summarizes the topic of Volume #2 - Tracking Email Communications. If you ask anyone familiar with Prosper202 whether it is possible to use the software to do what I discuss in this article they will tell you that it is not. So I am going to tell you how I manage to do it and how you can too. The subject of my magic show is traffic generation, and as you probably already know, the secret to getting all the traffic to your offers that you could ever want is to position yourself so that you can afford to spend more money acquiring your leads than anyone else possibly could. The Swedish pop group Abba said it best. The winner takes it all, the loser has to fall (add soulful seventies pop music here for full effect). Most paid traffic is simply auctioned off. He who bids the highest takes the lion's share and everyone else is left fighting over scraps. Of course, if you cannot make back at least $5.01 from each of your leads before they disappear from your "funnel" then you are NOT ABLE to spend the money. Bankrupting yourself by going over budget is something you want to leave to the other guy to deal with. Now, your "funnel" could be nothing more than the path that leads from your traffic source to your landing page and then to the vendor. In other words it is a temporary funnel lasting no longer than the time it takes for your lead to lose interest in your offer and disappear forever from your life. That doesn't sound too promising, does it? Or your funnel could be an email auto responder that captures the lead and re-markets to them the same offer (and other offers) over time. Wait. What's that? You say you want more details on how exactly it all works? Well congratulations, now you are starting to think like a true marketer. 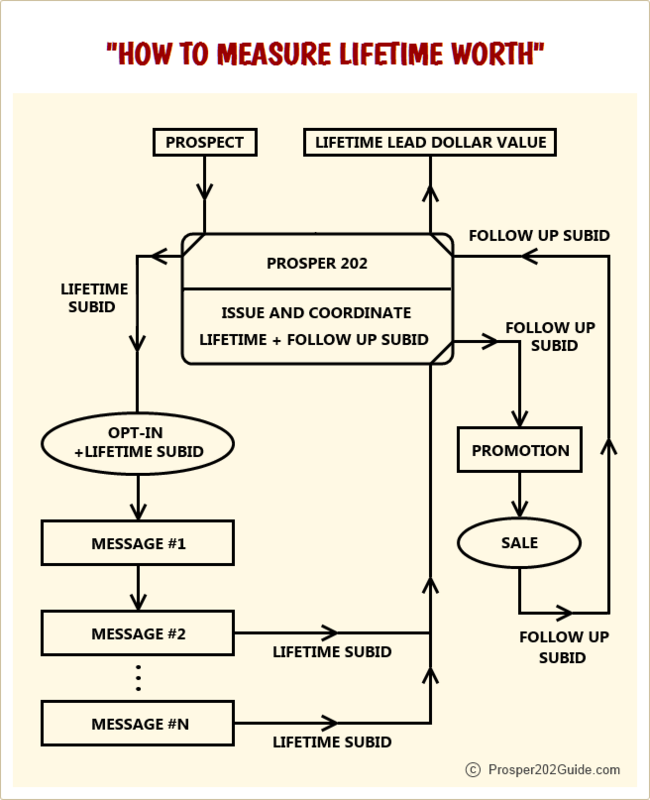 The extended time period associated with the second approach leads us to the concept of the "lifetime lead value". In other words, how much money, on average, does a lead spend during their time in your funnel? Once you know this value you know how much money you can afford to spend acquiring each lead. The greater your lifetime lead value, the better your chances of outbidding someone who has set their sight on your source of paid traffic. It should not be too difficult to see that the fellow who goes to the trouble of collecting a lead has a big advantage. By sending his subscribers a series of well-written informational and promotional follow up messages he can usually significantly increase his lifetime lead value. In contrast, the marketer who goes for the quick sale and lets his lead escape has squandered any opportunity to build on the initial momentum that his click-through has purchased him. For the marketer who has NO interest whatsoever in building lists the lifetime value of a lead is VERY EASY to calculate because they either buy as a result of the initial promotion or they do not. In this case the "earnings per click" reported in your tracking application is a direct measure of your lifetime lead value. If your EPC is $2.50 then your leads are worth two dollars and fifty cents to you, and they will (most likely) never spend another penny with you. But what happens when you DO capture leads and re-market to them? How do you go about figuring out your lifetime lead value then? Remember how I told you that I am a magician? The fact is you DO have to be something of a trickster to pull off the following feat. The way an EPC value is determined by your tracking application is that it first assigns a unique SUBID to each of your leads. Then, when the vendor "reports back" to the tracking application that your lead has purchased their offer the subid is marked by the application as having "converted". By automatically tallying the payouts due to all the converted subids for a campaign an EPC can be calculated and reported. When I say that the vendor "reports back" a sale I mean one of two tracking methods is used. Either a "conversion pixel" is placed on the thank you page of the vendor (and it is the pixel that communicates the conversion information back to the tracking application) OR the subid is passed directly to the vendor along with the lead, and then the subid is passed back to the tracking application when a sale takes place (this is the postback method of tracking conversions). But if we want to keep track of every sale that subsequently takes place while the lead remains in our funnel we have to CHANGE the behavior associated with the subid. First, by capturing the subid and writing it to the auto responder profile of our lead. Then for every future promotional email we send out we send along this "lifetime subid" and tell our tracking application to increment the payout value associated with that subid if another sale takes place. In practice we have to make a small modification to the Prosper202 conversion script to implement this behavior. From that point on, each time we launch a new "follow up" campaign to promote a product we can have Prosper202 track that campaign with a "follow up subid" and report back to the "lifetime subid" when a sale takes place. A schematic of the interplay between these two campaigns can be seen in the image below. Yes, it is a little more complex than you might be used to if all you have done to this point is set up tracking solutions for direct linking or simple landing page campaigns. But this is how you play the game at the next level, where knowledge of your lifetime lead value separates you from your competitors and gives you a distinct advantage in bidding wars. This is how you play to win with paid traffic.